The heartbeat of our church. The future of our church. The responsibility of our church. At each Sunday morning gathering (10:30 AM @ Newnan High School) we offer a full line-up for children's programing (Nursery-5th Grade). Our leaders are committed to providing engaging experience filled with worship music, Bible teaching & play time to meet new friends. We take the security of our children very seriously. One of the steps to ensuring their safety is check in. Each week every child is checked in using our Children's Check In system. Upon arrival to Newnan High School the entrance to the building will be clearly marked. When you walk into the building the very first station on your right is dedicated to 1st time kids check. Our volunteers will make sure to answer every question you have as well as walk you through the check in process. Our volunteers will be clearly identified by their Foundation Kids t-shirts. If you have been to Foundation previously, you will have already received a key chain tag in the mail with a bar code on it and a mobile pass. You will simply scan the key tag or mobile pass at the entrance to the children's ministry and the printer will print your child's sticker as well as the parent copy. We have designed our children's check in station to be as quick and simple yet still safe and effective as possible. If you forget your key chain tag or have lost it, NO WORRIES! simply tell the volunteer at the children's ministry entrance your last 4 digits of your phone number and they can print it from their iPad. 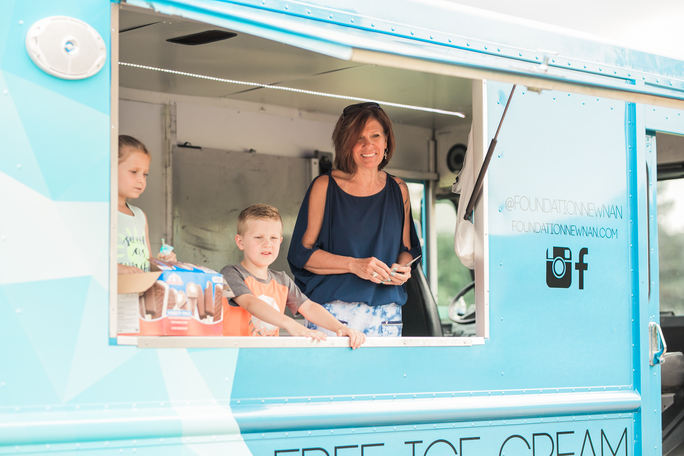 Kids love to serve on the ice-cream truck! We encourage kids to jump where they can. It is incredibly common to have kids serving along with adults on our ice-cream truck. In fact it is one of the kids favorite things to do! That could be because they get to sample the product through...well for now we will pretend its because they have incredible hearts to serve! We will never be an inwardly focused church. Our desire is to constantly be externally focused. So we look for opportunities to reach out and add value to our community. We do things like free art classes & the Ruth Hill Shoe project. If you woke up this morning thinking to your self: "I sure would like to make Robin's day!" then simply click on the button below and purchase something off of her Amazon Wish List for the Foundation Kids ministry. Each purchase will be shipped to our office at 30 East Washington St. Once a purchase is made, the item is automatically removed from the list, so no worries on having duplicates. The list will be added to on an ongoing basis, as Robin and her team identify needs, they will appear on the list. Thanks in advance for any gift you might send to Foundation Kids.